Now, you can have a whole gaggle of ghosts standing at your door or on your porch with THE HAUNTING GHOST TRIO! 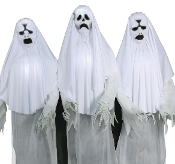 These three 6-foot tall (180cm) Ghost characters have fabric-covered PVC heads with light-up faces and torsos, draped white fabric costumes, posable arms with creepy plastic long-fingered hands, and a black fabric drape to hide the easy-to-assemble frame. Once activated, the Haunting Ghost Trio will begin moaning as their faces and chests light up with an other-worldly glow as each Ghost sways from side to side, wailing in eternal torment! The infra-red sensor works up to 6.5 feet (195cm) away and works in all lighting conditions - bright light to no light! Item includes volume control. Easy-to-assemble quick-connect poles. Assembly required.